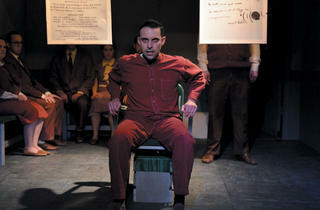 John Logan’s portrait of the man convicted of kidnapping the Lindbergh baby is powerful in a revival at BoHo. 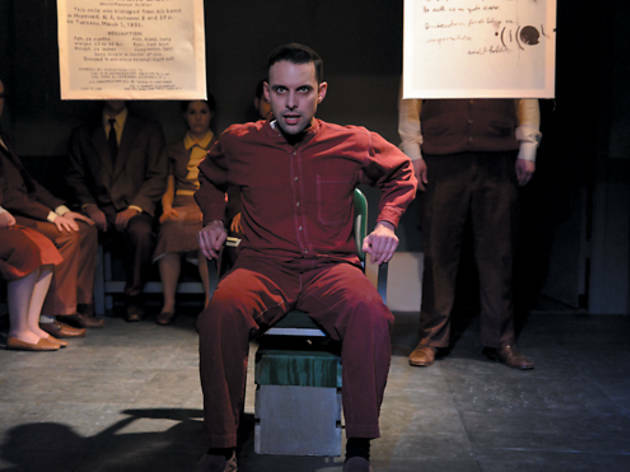 John Logan’s 1986 play, brought to stunning life by the BoHo Theatre, presents the story of Bruno Richard Hauptmann (Jeremy Trager), the man sentenced to death for the 1932 murder of Charles M. Lindbergh Jr.—the “Lindbergh baby.” As narrator, Hauptmann takes us through the mishandling of his case and his transformation in the media’s eyes from invisible German immigrant to infamous “Baby Killer” before the verdict had even been decided. Trager is mesmerizing in the title role, with a performance that’s deliberate and devastating. Eleanor Katz is equally strong as his wife, Anna, balancing grief with an inner strength that refuses to let her succumb, making her struggle all the more powerful. The rest of the cast is equally impressive, vividly rendering Hauptmann’s impressions of the law, the media and the Lindbergh family. The effective design supports but never distracts from the talents of the ensemble. Rachel Parent’s well-implemented red costume theme and Diane Fairchild’s intricate lighting help create a dream-like world that takes every advantage of the tiny theater. The play’s questions about fear, xenophobia and the effect of public opinion on the carriage of justice have lost none of their relevance. The artistry of BoHo’s production ensures they still pack a punch.